The sloppy execution of fake events may serve the purpose of dividing the observing public into two lists: The people who believe whatever they are told by “authority”, and the other people. Could they be compiling a list of people who see through the fakery? Once they have such a list then is it possible they would want to recruit some and eliminate the rest? Were this done systematically enough they might anticipate dividing the public into distinct classes of sheep and wolves. Operation Condor indicates to me that this sort of thing has already been done, and next time around they may hope to do a “better” job of it. Since you are reading this blog, which list do you think you are on ? This entry was posted in Comments on other forums on June 10, 2018 by ab. The business case for airport security (theater). I don’t think body scanners see much more than metal. I still opt out, and accept a pat down. I like the part about the random (fake) alerts on the scanners, and that people reward themselves in times of stress. Lets think about the business case for a moment. Currently airport companies make about 50% of their income with services (shops, restaurants etc.) and of course 50% with start and landing fees. When flights are delayed people spend more in airports. When security checks are longer, people are forced to be earlier at the airport. Then they buy water (you are not allowed to carry water, you might… what exactely?) for an exorbitant price, than food, parfume, chocolate or whatever. That is probabily the issue. In Munich, recently, I saw you can get a massage, cut your hair or get your fingernail done! All that in addition to buing food and drinks or shopping. So I guess the stress we are experincing at the security check is part of the plan. Allegedly, when people get under stress they tend to reward themselves more. Mentioning the cancer inducing effect of the check could be a hoax. Why? I flew this week for a couple of days to Portugal. I went through the machine (full body scan, 3D) and it „rang“. So the security man had to do a body check on me. Problem is, I was wearing a T-shirt, shorts, sneekers and not much else. Not even a watch. So I looked over the shoulder too see the monitor myself. It was highlighting my arms, and especially where you would carry a watch. Only, I did not. So the machine could be a box with random numbers, who knows. One last comment: the flight back was canceled and we spent 12 hours at the airport. Slept on the floor, bought very expensive water (I would refill, but sometimes they dispence only warm water, sometimes it tastes disgusting). This entry was posted in Comments on other forums, Corporatism on May 27, 2018 by ab. It’s hard being a moderator. I leave comments open to approved users to find pearls in the mud. They are few and far between, but so far, I think it’s worth the effort. Is it really wise for me to provide the manure with which people intend to throw at me? I do not think so. That is like an assassin saying to me, “Mr. Sibrel, I would like to shoot you, yet I have no bullets. Will you please give me some for my gun?”, and then me saying, “Sure! Here they are!”, and thus providing the very means for my own murder. This entry was posted in Comments on other forums on May 27, 2018 by ab. And finally for today, I just wanted to share a thought based on the reference above to “high-ranking officials are largely actors” and that this is one of the big secrets that limited hangouts try to distract from. The actor theory may or may not be true, and the theory that actor-leaders are one of the truths limited hangouts are hiding may or may not be true, but they are interesting questions. One thing that strikes me, though, is that actor-leaders aren’t that well-hidden a secret. Or, to put it differently, it’s a secret hiding in plain sight. People mocked Reagan for being a former B-movie actor without realizing that his experience had something to do with his being chosen. Trump’s experience as a reality tv-star and Wrestlemania character is similarly mocked without being considered as the basis for his selection by TPTB or indeed, part of the training they put him through with the Presidency in mind as a possibility. This site’s work on all the former rock stars who ghosted and in some cases reappeared makes a lot of sense in the context of actor-officials. And finally, this reminds me of something that people have said before, which is that Orwell’s 1984 and Huxley’s Brave New World were not “dystopian visions” but descriptions of the contemporary and future state of the art of power and control. And Big Brother is clearly a larger-than-life but actually non-existent front man. We’re all in Plato’s cave, watching the shadows flickering on the wall. And, just like with Wrestlemania, we WANT to suspend our disbelief. We want to believe that our cheerleading and voting and outrage in the Clinton-Trump show somehow mattered, in spite of the obvious fact that 1 vote out of 120 million is meaningless (and the count is rigged anyway). So we don’t want to think of these people as actors. But why wouldn’t they be? It would be silly for the controllers insist on being the stars of the show all the time. Sure, they get tempted sometimes, and sometimes do it. But certainly there are some powers behind the scenes. If there aren’t, then the world of power is more chaotic than competent controllers would want it to be. Think of it like a movie. The producer wants to tell a story, make some money, mesmerize the audience, and maybe influence their thinking a little. And it’s probably easier to do that with a glamorous front man actor. Sure, the producer might cast his cousin in a main part, and he might even give himself a cameo, but the important thing is for the movie to WORK on the audience, to not flop, to make money. The most powerful people in the world would rather CONTROL things than campaign and make speeches all day and draw the ire of half the country. The most powerful people in the world didn’t get BEATEN by community organizer Barack Obama in a power competition, they HIRED him for a pageant. We all know all this and don’t know it at the same time, in different proportions. Even among truth seekers like ourselves, who among us has no emotions about Trump and Hillary? It was a hell of a movie! This entry was posted in Comments on other forums, Uncategorized on August 17, 2017 by ab. 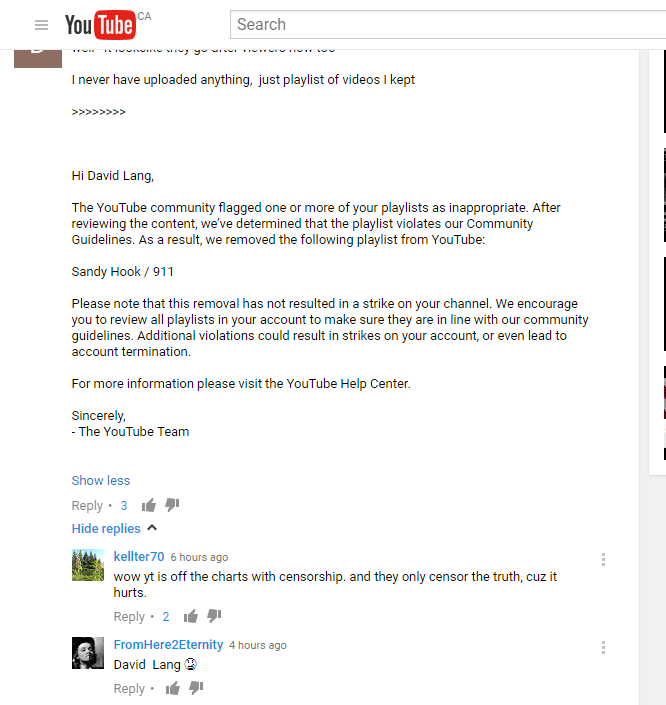 U-tube must be deputizing anybody to censor comments and videos, and now playlists. Time for people to migrate to their own websites, or other youtube like sites, or just plain old torrent sharing free programs to pass around videos, like resilio sync. This entry was posted in Comments on other forums, Corporatism on July 18, 2017 by ab. Made a donation/advertising buy on noagendashow.com… and got a mention for the site. I also got a few other mentions in for septemberclues.info… and September Clues, not to mention hoaxbusterscall.com…. Curry claims he’s never heard of September Clues. He also doesn’t remember the interview below from January 2013 with Markus. John agrees that 9/11 being a media hoax is just as good an explanation as any. John also got indignant at the nuke hoax lie. Two points regarding this donation. One, I think it is the way of the future for funding media. I prefer it to subscriptions for paying for what I consider good entertainment. Second, I think it’s quite possible these two are happy gatekeepers. I do think they do more good than harm, and I have benefitted from their discussions, including those on technology that I like using. Like everyone else out there, I don’t agree with everything they say – but don’t have to and don’t expect to. This entry was posted in 9/11, Cluesforum/September Clues, Comments on other forums on January 2, 2017 by ab. I asked Randy to comment – and he did right away! I am a big uber(man) fan – as a customer and a (very part time) driver. This entry was posted in 9/11, Comments on other forums on December 13, 2016 by ab. Different spellings, different actors playing the part. If you can’t convince, confuse. Mission accomplished with Gaddafi and Libya. This entry was posted in Comments on other forums, Political Theater on October 7, 2016 by ab. Do you think that viri exist at all? The whole science of virology I contend is a hoax, like nuclear “science”. Who has access to these electron “microscopes”? Are these images all phony or fabricated as well? They are as controlled as powerful telescopes. Anything we cannot sense with our 6 senses is subject to fabrication and fakeology – from very small to very large. This entry was posted in Comments on other forums, Health, HIV/AIDS, Nuclear, Science hoaxes on July 2, 2016 by ab.